Publishing is the act of "pushing" content to a web server to make it available as a browseable website. All modifications to a website remain in the CMS until a publish is performed. There are two web servers in which you may publish your site to, staging and live; both are enabled by default (if the site has not launched yet, only staging will be an option). During the publish process, you may disable publishing to either destination as needed. A typical workflow involves publishing an asset to staging only for a preview, and then to both servers when ready to go live (this keeps both servers in sync). Change site-name to your site's folder name in the CMS. You may share this URL with others for review. The live server is where your completed site will be launched to and available to website visitors through your site's official URL (e.g., www.cmu.edu/site-name). 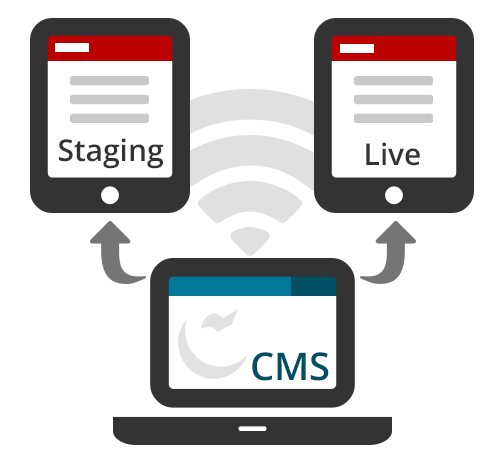 The CMS team will perform the initial publish to the live server during site launch; after launch you will be able to publish to the live server at any time. A publish can be performed on any asset (page, folder, file). When publishing a folder, all contents within the folder will be published; this includes publishing a base folder (i.e., the top-most folder in the asset tree containing the entire site) for a full site publish; base folder publishes are not recommended for larger sites (see tips). You may also view the publish queue in the Hamburger Menu in the Main Toolbar. The publish queue shows the status of all active publish jobs for a site and can be accessed in the Hamburger Menu in the Main Toolbar. Two publish jobs can be processed at the same time while others wait in the queue. You may modify the publish jobs waiting in the queue; select the radio button to the left of a publish job, then use the controls at the right to perform an action. After being published, an asset can then be unpublished (i.e., removed from a web server). Once unpublished, website visitors will no longer be able to access an asset. As a safety measure, visit the former URL of the asset to ensure it is no longer online; refreshing your browser multiple times may be necessary to confirm removal. Follow these steps to disable publishing for an asset. Note: When the Include when publishing setting is disabled on an asset, it is overridden if you delete the asset; upon deletion, the CMS will unpublish the asset to prevent the creation of an orphan. Adhering to the guidelines below will minimize the demand on system resources, allow for quicker publish times, and reduce unsuccessful publish jobs. How do I know what I should publish? A good measure is to ask yourself, "what is affected by my update?" If you made an update that affects multiple assets, publish all affected assets. Tip: use the find relationships tool to find and publish assets that may have been affected. If you modified a site-wide element (header, navigation, footer regions), publish the full site; see next topic. When and how should I publish my full site? A full-site publish is required every time a site-wide element (header, navigation, footer regions) has been modified; be sure to follow the publishing guidelines when publishing your full site. Note: One may think that performing a full-site publish is an efficient strategy to "catch everything" if updates were made on multiple pages. While this will publish all updates, it's not recommended especially if there are multiple website managers working on a site; a full-site publish may publish a page that's a work in progress and not ready to go live. As a rule of thumb, perform a full-site publish ONLY when required, and notify all other website managers ahead of time so they can disable publishing on assets that are works in progress. How do I know if my publish job was successful? Publish of Page 'sitename-page' completed (0 issue(s))"
If issues were encountered during publish, it will display the issue count; click on the notification to read more. The most common issue reported is broken internal links; if other issues are reported and you needed help understanding them, please contact it-help@cmu.edu. Can I schedule a publish? You can set the initial "go-live" date/time of a page or file using the Start Date option under the Metadata tab; this will trigger an automatic publish to both servers (staging and live) when the date/time is reached. However, if a page is to be added to the navigation, you will still need to manually perform a full-site publish. End Date and Expiration Folder settings are not functional. Regularly scheduled publish jobs (i.e., an asset set to be published every day at a specific time) are also possible but need to be configured by the CMS team; please contact it-help@cmu.edu to discuss your options. I tried publishing something but received an error saying the asset is not set to publish. If a publish attempt is unsuccessful and an error is displayed, it is likely that publishing has been disabled for the asset. Enable publishing based on the error received. Solution: Edit the asset and enable the setting for Include when Publishing; submit publish again. Solution: Find the parent folder(s) that has publishing disabled and enable it. Edit the immediate parent folder and check settings for Include when Publishing; if publishing has not been disabled, check the next parent folder in the hierarchy. After publishing has been enabled for all parent folders of the asset, submit publish again. In addition to publishing a page, do I need to publish the individual files I use on the page, such as images and documents? *Disclaimer: If the files reside in a folder which has had publishing disabled, the files will not be published. If images are missing from a published page, check to ensure the images' parent folder(s) have publishing enabled. I published a page and checked the publish queue but it says there are no active publish jobs. That's because it's lightning fast! The publish process moves quickly, especially for individual assets such as pages and files. Folders that contain multiple assets are likely to remain in the queue longer. I updated a page and published it but I&apos;m not seeing my changes. Option 2: Maybe it is the CMS? Not the browser? Try these tips for additional troubleshooting within the CMS. Check the publish queue to ensure the publish job has completed; an empty queue means all jobs are done; if your publish job is still in progress, please be patient! If all fails, send an email to it-help@cmu.edu and we'll take a look! I unpublished a page from my website, but it still shows in the navigation. When I click the link, it says "File Not Found." How do I fix this? Each time you make a change to a site-wide element, which includes the navigation, a full-site publish is required. Follow the steps below depending on the scenario. Scenario 1: You deleted the page from the CMS and unpublished it from the website. Solution: perform a full-site publish to correct the navigation on the live website. Scenario 2: You unpublished the page from the website but want to keep it in the CMS for archival purposes.